It seems like there have been some changes to ThruLines since I first experimented with it. 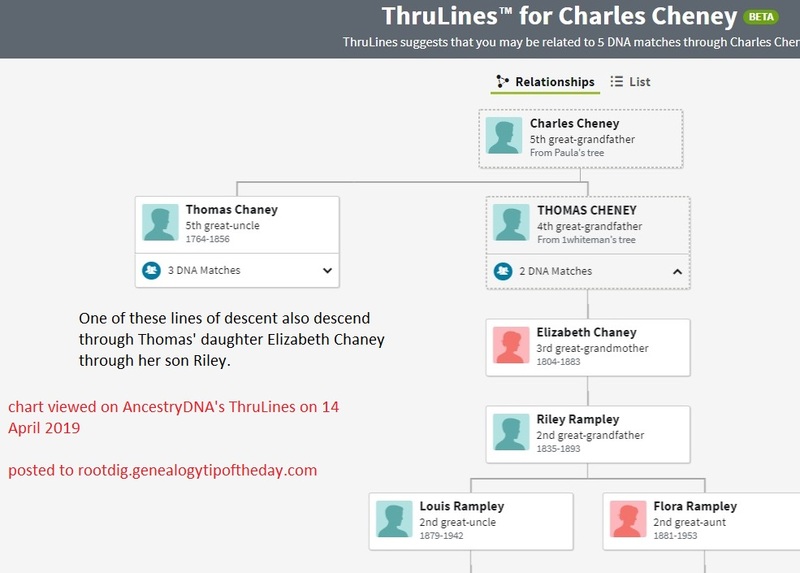 ThruLines (through it’s automated processes) indicates as of 14 April 2019 that Charles Chaney had two sons named Thomas. My immediate family appears in the family of the left Thomas (shown in the first image). ThruLines (based upon my tree attached to my DNA results apparently) correctly indicated that my grandfather was Cecil Neill and that Frances Rampley was his mother. No relationships are given for Riley Rampley and Elizabeth Chaney. The left Thomas is shown as my 5th great uncle even though the tree shows that he’s my ancestor. The “left hand” Thomas Chaney “son” of Charles. This portion of the ThruLines shows my descent through Cecil Raymond Neill. The “right” Thomas is indicated as being my 4th great-grandfather (correct based upon what is in the tree attached to my results). However the chart of descendants for this Thomas does not include me. 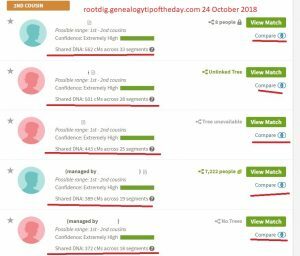 It indicates that Elizabeth Chaney is my 3rd-grandmother and that Riley Rampley is my 2nd great-grandfather (both relationships consistent with what is in my attached tree). But I’m not in this “branch” myself. It looks like the ThruLines algorithm decided that Thomas Chaney and THOMAS CHENEY were different enough to be two individual people. The white boxes are individuals that in my tree. How the algorithm behind TrueLines decided to split the family into the two parts is beyond me. But one would think it would be programmed to notice that there are children of both Thomases that are extremely similar individuals. It really seems like this problem should have been caught in the earlier stages of testing.